TAG Heuer announced the launch of a unique timepiece it has designed in collaboration with the Dubai Department of Tourism & Marketing (Dubai Tourism) at Arabian Travel Market (ATM). Luxury timepiece manufacturer put the Dubai special edition watch on display at the region’s biggest travel show held at the Dubai World Trade Centre. TAG Heuer, part of LVMG Group, says The Dubai Connected Watch Modular 45 is a living testimony to a successful partnership between two brands whose brand values both represent a harmonious blend of tradition and modernity. 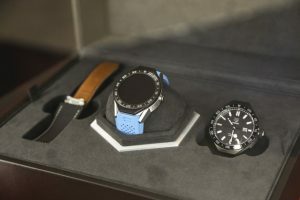 The watch’s original design TAG Heuer Connected Watch Modular 45 was launched in March. It is first TAG Heuer Modular luxury watch bearing the Swiss Made label. “Launched on March 14th, in the heart of Switzerland in Brunnen, the TAG Heuer Connected Modular 45 is the first TAG Heuer Modular luxury watch bearing the Swiss Made Label. There are only a total of 200 timepieces up for grabs from the third week of June. The luxury watch is priced at AED8,000.